The U.S. bank prime rate remained unchanged in early July, at 3.25 percent. None of the credit card offers tracked by this survey changed during the first two weeks of July, continuing an extended period of stability for credit card rates. That stability is especially remarkable compared to an erratic economic environment in 2014 so far: the US economy suffered a setback in the first quarter, but lately seems to be gaining strength. Given that unemployment has been a chronic problem since the Great Recession, perhaps the most meaningful indicator of economic progress these days is job growth. By that measure, the economy seems to have found new legs in recent months. On July 3, the Bureau of Labor Statistics reported that 288,000 new jobs were created during June. On top of that, prior job creation estimates for April and May were upgraded. The US economy has now created in excess of 200,000 jobs for five straight months, a welcome contrast to the halting recovery that has been experienced since the end of the Great Recession. If growth continues to gain momentum, interest rates ranging from savings account rates to mortgage rates can be expected to rise. For credit card rates though, strong growth carries a benefit that can offset the natural tendency of rates to rise in an economic recovery. A healthier economy tends to bring healthier consumer balance sheets, and as credit ratings improve, credit card companies can feel more confident about offering lower rates. So what could go wrong? Specifically, what is there about this scenario that could lead to higher rather than lower credit card rates? Rising debt. After falling sharply shortly after the Great Recession, credit card debt outstanding has risen in each of the past three years, and is up again so far this year. Other forms of non-mortgage consumer debt never did fall significantly, and have continued to reach new highs. All of this raises the question of how much of the recent resurgence in the economy is being fueled by debt. This not only would counter the theory that a strengthening economy will improve credit ratings, but ultimately could lead to the recovery running out of steam while consumers are left with increased debt burdens. Inflation. The rate of inflation has increased in each of the past three months. This is a warning sign, since credit card companies need to protect the margins they earn over the rate of inflation. 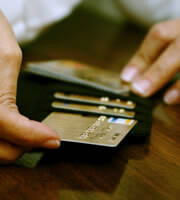 Continued increases in the inflation rate could force credit card rates upward. For now though, consumers can enjoy rate stability and hope for the possibility of lower rates in the months ahead. However, the above two factors are a reminder that there are no sure things in economics. Average rates on consumer non-rewards and rewards credit cards were unchanged in the first part of July. Rates on student credit cards have not changed since February. Business rewards and non-rewards credit card rates were unchanged in the latest survey. With no change in any of the consumer credit card offers tracked by this survey, the spread between the overall average credit card rate and the rate offered to customers with excellent credit remained at 4.01 percent. In total, IndexCreditCards.com surveys information from nearly 50 different credit cards, and includes multiple credit-rating tiers from many of those cards. Examples of offers surveyed include American Express, Capital One, Chase, Citi, Discover, and other MasterCard and Visa branded cards. The information compiled not only demonstrates trends in credit card rates over time, but also indicates the different values credit card companies put on different target markets (consumer, business, etc. ), as evidenced by the differences between rates for those markets. 0 Responses to "Credit card rate stability continues"